Neurological long term conditions affect nearly 10 million people in the UK population. Yet for nearly a decade, progress on improving care for this cohort of patients has been disappointing. The commissioning and provision of neurological services is complex, with responsibilities split across clinical commissioning groups (CCGs), specialist commissioners, community services, acute hospitals, primary care, neuroscience centres and social care. Published in 2005, the National Service Framework for Long Term Conditions outlined recommendations for improving care. However, whilst some services are outstanding, variances remain across the country. To create alignment in the system across all stakeholders – providers, commissioners and patients – the NHS in April 2013 established Strategic Clinical Networks across the country. There are twelve Strategic Clinical Networks (SCNs) across England and the role of the SCN is to encourage collaborative working across the boundaries of commissioning and provision, in key areas of major healthcare challenge where a whole system, integrated approach is required. Their remit is based on the NHS Outcomes Framework, which sets measures to help the health and care system to focus on quality and safety in the NHS and promote the delivery of both national and locally decided health care priorities. The London Neuroscience SCN held a launch event in the Summer to begin establishing relationships. The event served to bring stakeholders together to debate the challenges we face and using a proposed strategy as a foundation to set the direction for an improvement work programme. A themed (rather than condition) approach to priorities for improvement has been developed with four priority areas. All will support primary and community care to improve the patient experience. All will require primary and community care participation and input in their development. • Commissioning standards for quality and safety in the management of patients with acute and chronic neurological conditions. Covering the entire patient pathway, we will identify the standards our patients and carers deserve to live as normal life as possible. An organisational audit of providers will highlight the variances across London in care and focus future improvement projects. • Integrated care – These will focus on case management models that efficiently support the patient through their care pathway. It will include individual health and social care plans and self management. The project will specifically cover the interface between health and social care and we are linking with the NW London Integration pilot (over 75s and diabetes) to explore how integrated care for neurological conditions could work. • Central resource for information – Patient information on conditions and services available in London will be linked to a central online London neurologic directory to signpost patients, carers and professionals. • Education programmes for non neurologic-trained professionals – these will help to improve how providers work together, particularly at the handover point of the patient pathway. Besides knowledge education we will be looking at IT innovations and decision tools. the health and care system and patient representation. Local (borough-based) teams are being established, drawing on the energy, expertise and drive for improved care from hospitals, community services, local charity organisations and patient groups. 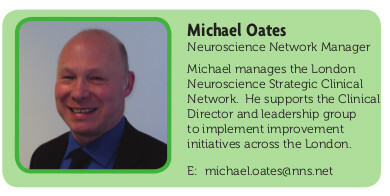 They will use the outputs of the London Neurological SCN to influence providers and commissioners at a local level. The voices of patients and the public are vital to improving services and making changes based on what they want from services. The London Neurological SCN has established a Patient and Public Involvement working group that will help to shape our current and future work. If you are a London GP or community worker, we encourage you to join us in improving care in the capital for neurological conditions. There is a lot to do, and we cannot as health and care professionals let another decade go past without making these changes now. The Yorkshire and Humber region has a population of just over 5 million people, close to 10% of England’s population. Most of the population is concentrated in the big cities and conurbations, especially in West and South Yorkshire, with Leeds, Sheffield, Bradford and Kirklees the four biggest districts. All geographies have seen their populations grow in recent years, with the exception of North East Lincolnshire and Hull. Urban areas typically have an increased percentage of older aged residents which significantly impacts on health care provision across the region (Health & the Economy in Yorkshire & the Humber). • Linking with the national team to develop clinical indicators for neurology. • Working with partner health providers to redesign the regional neuromuscular referral pathway. • In partnership with providers to redesign acute care pathways to promote timely access to neurology opinion and help people feel supported to self manage. Domain 2 – enhancing quality of life for people with long term conditions and domain 3 – helping people recover from episodes of ill health or following injury. • Working with health and social care partners to develop a neurology commissioning guide, which aims to help commissioners (and providers) negotiate the complexities between specialist and non specialist care and rehabilitation. Domain 4 – Ensuring people have a positive experience of care. • Developing links with patient and public organisations in order to gain feedback regarding the implementation of the neurological pathways being developed. • Promoting the development and delivery of quality standards across the region in line with the national direction. The SCN is engaged with all 24 CCGs and has established a clinical expert group for neurology (CEG); members are predominantly regional Consultant Neurologists and this group, alongside our commissioners, will inform the main drivers jointly shaping neurological services locally. The Thames Valley region has a population of about 2.5 million people; it covers Berkshire, Buckinghamshire and Oxfordshire. 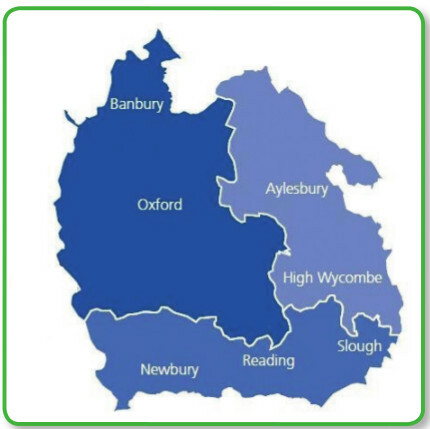 It is the only region where the Unitary Authority boundaries correspond to the health care boundaries, making it much easier to redesign and commission integrated patient flows. Much of the population is concentrated in urban areas such as Oxford, Reading and Slough; however there are large rural areas based around towns such as Aylesbury and High Wycombe. As with much of the UK there is a growing elderly population but also a large student population based around Oxford and Reading; both these factors will influence and impact health care provision across the region and its economy in Thames Valley The Thames Valley SCN current work plan priorities across the Thames Valley SCN for neurology are similar to those of the Yorkshire and Humber SCN. Priority 1 – Based on Domain 1 of the Outcomes Framework – securing additional years of life for the people of Thames Valley with treatable mental and physical health conditions; Increasing awareness and early diagnosis at emergency presentation in Secondary care. • Neurology (headaches, epilepsy and medically unexplained symptoms) as Ambulatory Care Sensitive (ACS) and recognised as being able to be managed in the community. Project to redesign services to ensure senior decision making at front line matched with appropriate community support so patients receive appropriate treatment management pathways. Priorities 2 & 3 – Based on Domains 2 & 3 – to improve the health related quality of life for the people of Thames Valley with one or more long-term conditions, including mental health conditions. • To optimise recovery and enable people to regain their independence as quickly as possible following ill-health or injury, whether this is from a planned procedure or an emergency event. • To support CCGs in the adoption and implementation of best practice models of care. • Drawing on best evidence, provide commissioners with advice on the value and most effective provision of psychological therapies for people with neurological conditions. • To develop a series of recommendations to improve the quality of services for people with neurological conditions based on the project undertaken by National Commissioning Support. Priority 4 – Optimisation of patient pathways across commissioning systems, to enable patients to experience the right care, at the right time in the right place. • Developing links with patient and public organisations in order to gain feedback regarding the implementation of the neurological pathways being developed through Steering Group and events and working with the third sector such as the Neurological Alliance. • Set up community support networks to ensure that there is early diagnosis and timely management of neurological conditions to ensure positive patient experience and reducing unnecessary admissions. • Development of a service model for a Thames Valley-wide integrated care pathway for headache and pain. To involve a GP with special interest (GPwSI) and specialist nurse pilot; Thames Valley wide network of GPwSI supported by Neurologists and Specialist Nurses; links to tertiary centres and specialist expertise. 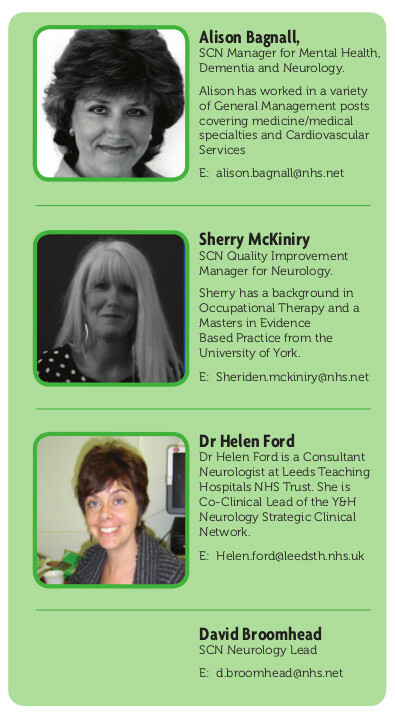 The SCN is engaged with all 10 CCGs and is looking to establish a clinical expert group for neurology; as with the Yorkshire and Humber SCN, members will be predominantly regional Consultant Neurologists and this group, alongside our commissioners, will inform the main drivers jointly shaping neurological services locally. The footprint for our SCN is large with a varied geography and socio-economic population. A network had previously existed for Greater Manchester but there had been no such arrangements in Lancashire and South Cumbria. Over the past few months, the new SCN has focused on developing relationships with key stakeholders across the footprint. This has been relatively straightforward with service providers as many neurology services are provided by three key trusts including two neuroscience centres. Providers of community services are more varied and there is still much to be done in understanding the service provision across the patch. • Improving access to and quality of neuro-rehabilitation services. There is a challenge in motivating CCGs to engage with the SCN to improve services for people with neurological conditions. The responsibility for commissioning most secondary and tertiary neurosciences services lies with NHS England specialised commissioning teams and with the reduced resources available CCGs are tending to focus their energies on other areas of care. 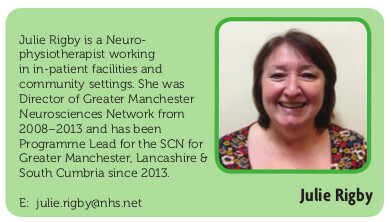 The Greater Manchester, Lancashire & South Cumbria SCN would welcome the opportunity to work with local GPs, community service providers and Local Authorities to support high quality care for all people with neurological conditions now and in the future.